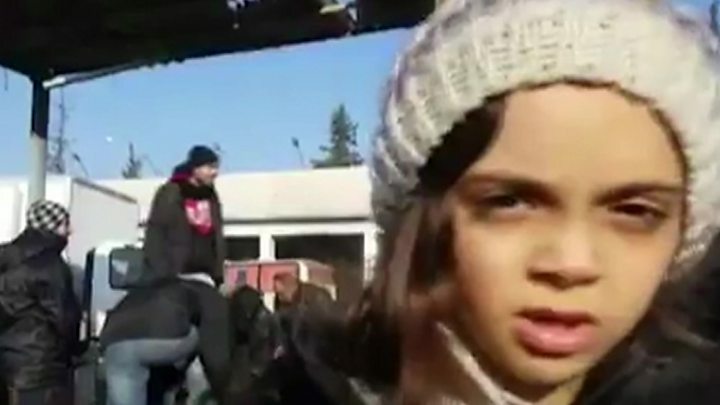 Media captionSpeaking through a translator, Bana Alabed thanked "those who have been asking about our news"
Bana Alabed, the seven-year-old girl who has been tweeting from eastern Aleppo, has been safely evacuated. 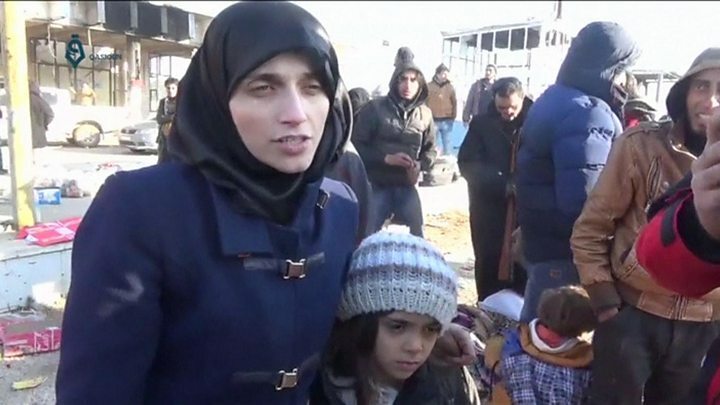 She was among the first groups out after evacuations resumed from Aleppo late on Sunday. Bana and her family - mother Fatemah, father and two younger brothers - were airlifted to Turkey on Monday afternoon, the BBC has been told. The little girl joined Twitter in September, tweeting about her life in the besieged part of the city. It captured everything from the death of her friends to her attempts to live a normal life. However, as pro-government forces began to close in on rebel-held east Aleppo, the family began to fear for their safety. In recent days, the Twitter account had appealed for rescue. The last tweet signed by Bana read simply: "Please save us now." On Sunday they were finally on their way to safety on one of the buses evacuating people from what little remains of east Aleppo to rebel-held areas to the west of the city. Fatemah later told reporters they had been trapped on the bus "like hostages" waiting to leave the city for 24 hours without food and water. But on Monday, Bana, dressed in a warm, woolly hat, appeared relaxed and calm as she posed for pictures and stood next to her mother who thanked "all the friends" who had helped them reach safety. She told Turkish news agency Anadolu: "We endured endless bombardment in Aleppo. "We have managed to escape the destruction, because our house was reduced to rubble. "I would like to say thank you to all those who have been asking about our news." Fatemah, who has a background in journalism, explained she decided to start the account to show "how much kids are suffering from bombs and everything". Speaking to Qasioun News Agency, she said: "We are happy because our voice reached all the world. "[But] I am sad because in my country, I leave my soul there." At about 17:00 local time (15:00 GMT), the family was airlifted to Turkey. Dr Ghanem Tayara, of the Union of Medical Care and Relief Organisations (UOSSM), told the BBC it had made a direct appeal to President Recep Tayyip Erdogan to ensure Bana's safety. "Thankfully he sent his special representative with a helicopter," he said. "The family are very brave - it is a relief." Media captionFateman Alabed: 'I am sad because I've left my country - I've left my soul there"
Turkish Foreign Minister Mevlut Cavusoplu, who Fatemah had tweeted last week from the Bana account asking for help, confirmed the family were brought to Turkey, Anadolu news agency said. Some had questioned whether the account was a publicity stunt and claimed Bana actually lived in Turkey already.